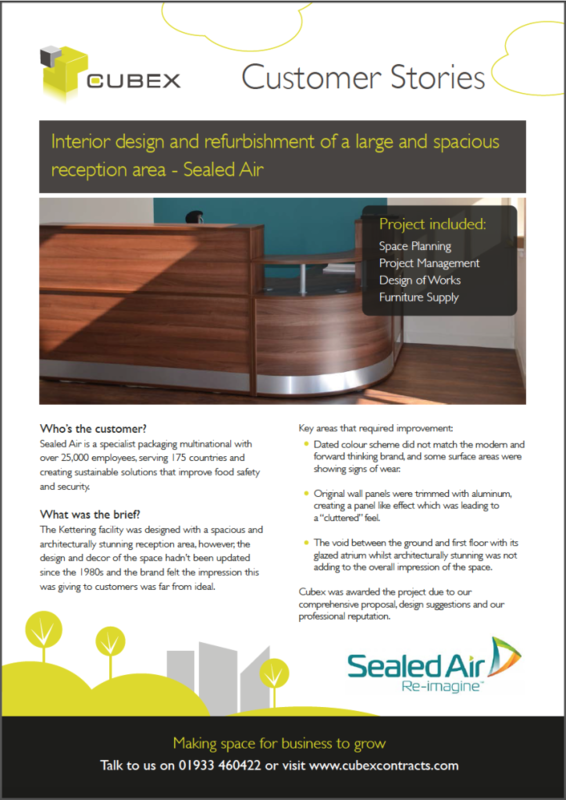 Cubex Contracts is a specialist company with expertise in office refurbishments, fit outs and interior design. Our space planning and design service devises intelligent and creative work spaces to support the growing needs of SME’s. Space planning – we will help you get the most from your existing space to help you grow and avoid the need to move premises before it is absolutely necessary. Office Interior design – our creative team will create designs specific to your needs, which are on brand and within your budget. Office fit outs – if you have moved into a new premises and need your space to be designed to suit your needs we can help you do just that. We will take care of everything from space planning and office interior design to the supply and install of all the fixture and fittings to taking delivery of your furniture and placing it exactly where it needs to go. Office partitioning – we can create new spaces for meeting rooms, additional offices and staff facilities using fixed or semi-permanent office partitioning that is either solid wall or glazed to meet your exact requirements. 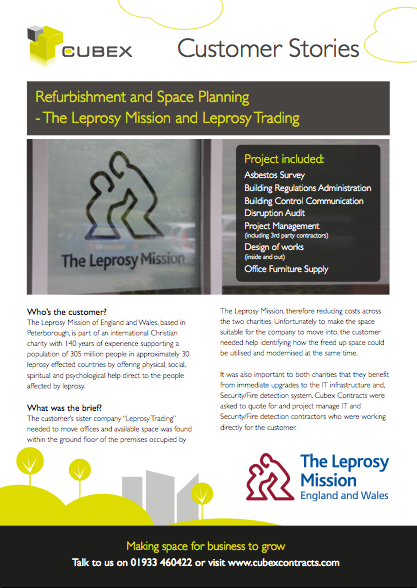 Office flooring – we can replace your old office flooring with a new more suitable covering. High traffic areas will be provided with hard wearing carpet, tiles or laminates depending on the style you choose. Office ceilings – suspended ceilings are very popular for covering up unsightly ducting and pipework and can house smart new LED light panels so your staff has the best environment to work in. Office furniture – we offer an office furniture service to any customer who requires it. Not only do we have a wide range of furniture and accessories to suit any style or budget, but we also arrange the delivery, install and set up of your space. We even take away the packaging so you don’t have to do a thing. Cubex Contracts will help you fit out your new offices or update your existing space – contact us today on 01933 460422 about our complete office refurbishment service. 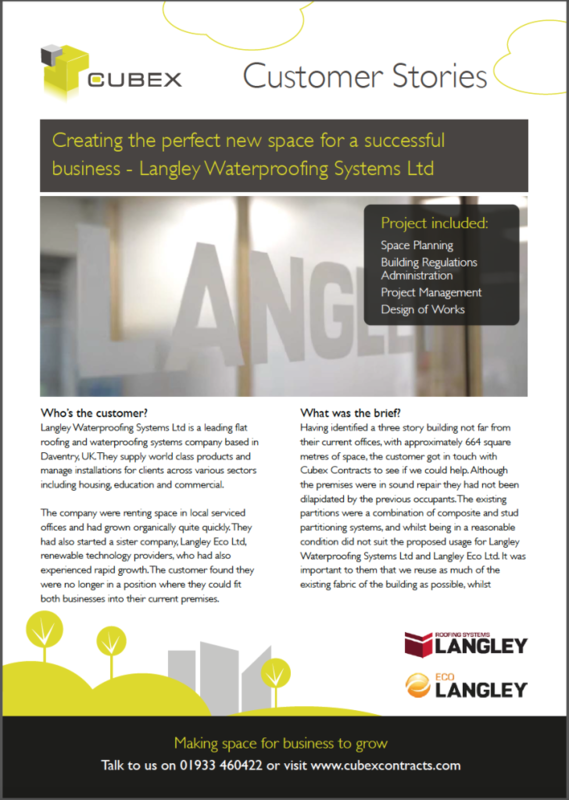 Megan Nelson, Marketing Manager of Langley Waterproofing Systems and Langley Eco Ltd. If you are looking for a local company to help you fit out your new offices, or update your existing space with a complete office refurbishment contact Cubex Contracts today on 01933 460422 to discuss your requirements.